This week I had to give a lecture on Internet basics at the symposium "Internet and Civil Law" at the German "Richterakademie" (which is a conference center esp. for judges) in Trier. 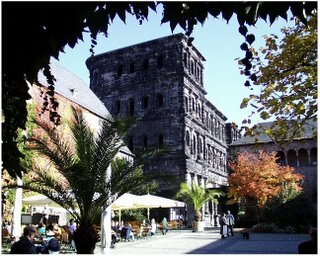 I lived in Trier when doing my PhD before I went to the University of Jena. It's interesting to get back to a town where you have lived for a long time. Everything seems to be rather familiar....but it isn't anymore. Things are changing. Another semester is over now. Again I had an interesting class for my lecture "Informatik der digitalen Medien" with students of 'lectureship' (=Lehramt), i.e. students who want to become a teacher, coming from a variety of fields of study. Working with students of computer science is always (...better say most times) easy, because (at least you should assume) they all have the same background. Here, it was completely different. The fields of study of the students was ranging from german and geography, over sports and other languages, up to mathematics and computer science. All in all, really a great variety...and we had a lot of work to do: only 14 lectures and the material was ranging from computer network basics, coding theory, data compression, up to web technologies. I like these lectures, simply because they teach you (i.e. me as a lecturer) to look at the stuff of your daily work from a completely different point of view. You have to explain things in a way that also non computer scientists (with almost no mathematical background) will understand....and that's a tough job, sometimes. The lectures are recorded on video and available at its web page.